The effects of Hurricane Matthew struck Orange County and the greater Orlando area during the early morning hours of Friday, Oct. 7, 2016. The Category 3 hurricane was the first major storm to impact Central Florida since 2004 when the state experienced four back-to-back hurricanes – Ivan, Charley, Frances and Jeanne. The Orange County Emergency Operations Center (EOC) was activated from a Level 2 to a Level 1 on Thursday, Oct. 6 to mobilize emergency support functions —a total of 20 ranging from Communications to Law Enforcement to Search and Rescue — to respond to the community’s needs. One of the key functions of the EOC was communicating life-saving information to residents across the County. Through multiple platforms, including web updates, social media, live broadcasts of media briefings by Orange TV and continuous updates pushed through Orange County’s emergency notification and information smartphone apps, OCFL Alert and OCFL News, Orange County provided critical information before, during and after the storm. On Facebook and Twitter alone, Orange County and Mayor Teresa Jacobs’ pages received 1,288 messages and sent 211 updates that garnered 2.71 million impressions. Within the first 48 hours, the Communications Division responded to almost 100 media requests for information on the storm. Orange County opened shelters at local schools in anticipation of the storm – six for the general population which included two that were pet friendly, one for special needs and one for emergency responders, including County employees and their families. More than 1,400 citizens took refuge in Orange County shelters, including 80 citizens with special needs. These shelters opened with the support and coordination of Orange County Public Schools and the American Red Cross of Greater Orlando. The Salvation Army Orlando Area Command and the Red Cross were integral to the success of the Orange County shelters and operations at the EOC. The Red Cross staffed and supported Corner Lake Middle School and Bithlo Community Park shelters, while the Salvation Army graciously fed emergency responders and support teams who worked through the night at the EOC. To help prevent damage caused by stormwater, Orange County Public Works began distributing sandbags to residents on Wednesday, Oct. 5. By Thursday afternoon, Public Works had distributed more than 78,000 sandbags to area residents. Orange County Fire Rescue also made extensive efforts to notify and coordinate the evacuation of the County’s manufactured home communities sending more than 9,200 Code Red, or reverse 911 messages, to all manufactured home residents. Twenty teams went door-to-door speaking to residents and handing out fliers to encourage their evacuation. This was followed-up by Emergency Response units driving through the Orange County’s manufactured home parks communicating evacuation messages late into the night as the effects of Hurricane Matthew came into Orange County. These efforts accounted for an extremely high compliance rate – approximately 80 percent of residents that said they would evacuate their homes did so accounting for some of the 1,400 individuals who took refuge in Orange County’s shelters. Additionally, prior to the storm reaching Orange County, Fire Rescue sent a strike team of ambulances to Brevard County to help evacuate a Wuesthoff Hospital. Immediately after the storm, Fire Rescue responded to the needs of our coastal neighbors by sending strike teams of ambulances to St. Johns and Volusia counties to aid in their recovery. The final strike team returned to Orange County at Oct. 12. Due to the forecasted path and the expected severity of the storm, Mayor Jacobs also issued a mandatory curfew for Orange County in an effort to protect the life and safety of all citizens and first responders. The curfew went into effect on Thursday, Oct. 6 at 10 p.m. Citizens were encouraged to remain off the roads for their safety and to allow first responders and emergency personnel to do their jobs during restoration. Orange County Fire Rescue responded to 302 calls and 519 units were dispatched. Orange County began damage assessment Friday afternoon and deployed teams to evaluate the overnight impact of Hurricane Matthew. After assessing roadways and evaluating safety concerns, Mayor Jacobs lifted the curfew for Orange County citizens at 2 p.m. on Friday, Oct. 7. 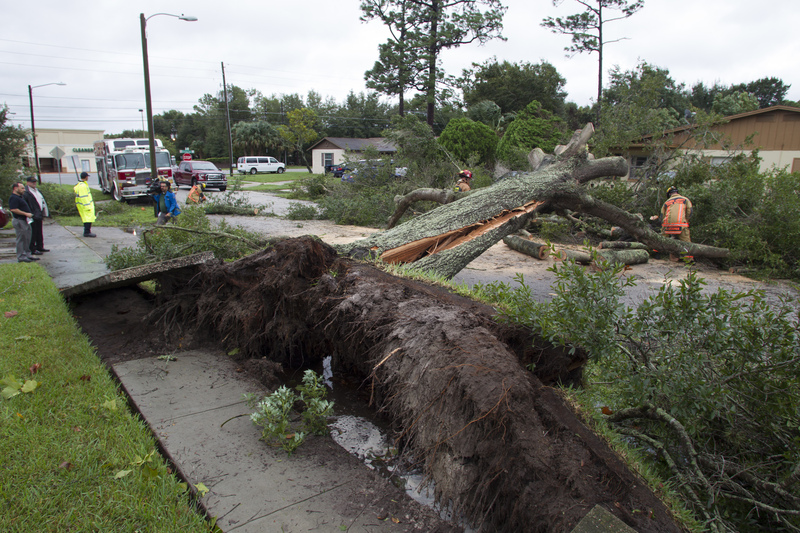 It was determined that approximately 110,000 Orange County residents were without power. Duke Energy and the Orlando Utilities Commission (OUC) worked tirelessly to restore service as soon and safely as possible. Orange County’s Emergency Operations Center downgraded operations on Friday evening to Level 3 monitoring status. There were 20 calls regarding property damage and safety assessments received by the Orange County Building Department and five safety assessment teams were dispatched to perform inspections on properties within unincorporated Orange County. Preliminary reports showed that most of the damage caused by Hurricane Matthew related to damaged roofs, pools, fencing, manufactured homes and carports. There were minimal impacts to Orange County’s water facilities and there were no outages. Only four of the lift stations were operating on generator power. Don’t mix yard waste with garbage. Bundle limbs, palm fronds and similar items with string. Keep bundles 3 feet long or less. Limit weight to less than 60 pounds. Unsuspecting Orange County consumers can be easy prey for unlicensed contractors whose bids are almost inevitably much lower than the bids of licensed contractors. The strong appeal of saving money can be overwhelming, but buyers must beware. The cheapest contractor available may be the one who will cost the most in the long run. For more information on the Orange County Consumer Fraud Office and protecting yourself from fraud, go to www.ocfl.net/fraud, call 407-836-2490 or 311, or email fraudhelp@sao9.org. The home repair/construction complaint form may also be found at www.ocfl.net/fraud and you can report unlicensed contractors by calling 407-836-5960.